The José Maria Cordova International Airport not only serves the city of Medellin, but the entire metropolitan area as well. The location of the airport is not that far from the central business district of Rionegro municipality. The airport is one of the largest ones in the area and is able to handle large tracts of passengers. Is there accommodation in the airport? These are only a few of the accommodations facilities available close to the airport. If you are looking for something more affordable, then you might as well consider looking for hotels near the area that provide bed and breakfast. What transportation options are there from the airport? It has already been established that several passengers go through the Medellin Jose Maria Cordoba Airport on a daily basis. It is only logical to assume that there will be several transportation options available to you. There are public means, and there are private means. If you are there to visit and experience the city of Medellin then public means of transport will not do you justice. Taxis and buses will limit the places you can visit in one way or the other. This is why the recommended mode of transportation for anyone visiting the city is car hire. With a car for hire, you will be free to move wherever and whenever you want; as long as you have a working GPS or an accurate map you will be good to go. Most people also prefer cars for hire because of the privacy it offers whether you are travelling alone or with your family. If you do decide to hire a car, then you can book one in advance or immediately you reach the airport. It entirely depends on you. What can I do as I await my flight? You can buy something to remember your visit with at the airport gift shop or get yourself something nice at the duty free shop. If you carried your wireless device, then you will be able to use the free wireless internet within the airport and surf the internet as you wait for your flight. What attractions can I visit in Medellin? 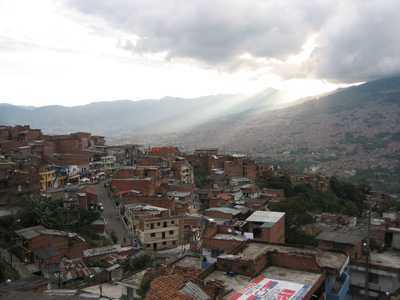 The above are just but a few of the places you can explore while in the city of Medellin. Parking your rental car in Medellin Airport can best be done in a garage. Its safer for you and your rental car. There might be the possibility to park your rental car in the outskirts of Medellin Airport and move around by public transportation which is not too expensive and will compensate for the parking fee you will need to pay if parking in the city center. Take in mind that many big cities have a city center only accessible for locals or delivery purposes. Most major car rental agents in Medellin Airport offer one way rentals. One-way rental is when you collect the car in one place and return the car in another location. In most cases the car rental agent will charge an extra fee if you wish to return the vehicle at a different location. In the terms and conditions will state if the one-way fee is included in the rental price. If the one-way charge is not included in the rental price, the one way charge needs to be paid on arrival directly to the car rental agent. In Medellin Airport, many car rental companies offer different types of cars, from small cars to large SUVs. Rentalcargroup.com has made it easy for you. Simply filter the results. If you are looking for an SUV, click SUV and you will see all the SUVs you can choose. You can also see if the SUV is a 4 * 4 guaranteed, because not all SUVs are guaranteed 4 * 4. If you want a guaranteed diesel car, use the search filter and you will have the guarantee that you will get a diesel car. Last month, the average car rental length at Medellin Airport was 1 days. The average rental car length at Medellin Airport is 6 days. The most booked rental car type currently at Medellin Airport is ECONOMY cars. Last year, the most booked rental car type at Medellin Airport were COMPACT cars. How much does it cost to rent a car at Medellin Airport? Last month, the average car rental price was 35 USD. Last year, how much did it cost to rent a car at Medellin Airport? Last year, the average car rental price was 277 USD. What is the current average daily price to rent a at Medellin Airport? Last month, the average rental price was 35 USD per day. How much did it cost to rent a car at Medellin Airport over the past 12 months? Last Year, the average rental price was 49 USD per day. The car rental companies available at Medellin Airport are: Localiza. See below last 5 customer reviews. Our customers rated Medellin Car Rental with an average of 10.00 based on 1 ratings.